I am who God says that I am: "I am BEAUTIFUL!" 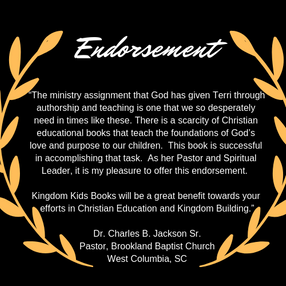 Hi Everyone, in celebration of the New Year and in an effort to share God's vision for Kingdom Kids Books, I am going to be sending out Declarations from my first book, "I am who God says that I am". In the book of James, we find that death and life are in the power of what we say. What are we saying to our children and those God have placed in our lives? 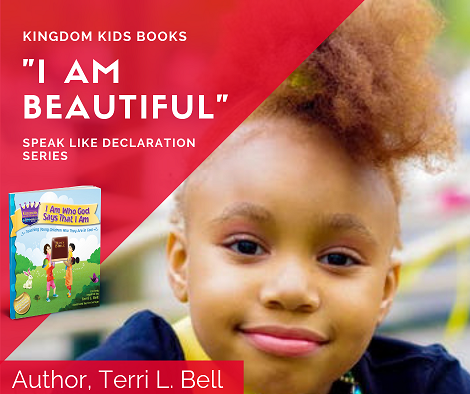 DECLARATION #1 "I AM BEAUTIFUL"
In Ecclesiastes 3:11a, God says that He has made everything beautiful and set heaven (eternity) in the hearts of His children! So, why are our kids dealing with low self-esteem and measuring their beauty by the compass of others? What can we do to combat the real life challenges of peer pressure and the influences that surround our children; young and old? How can we teach our young children to know their beauty (inside/out) so they are empowered to never let anyone tell them the opposite of what God has said? We can...SPEAK LIFE into the lives of our children! We can be purposeful in communicating the truth of God's word to our children. When was the last time you told your child(ren) how beautiful they are and how much God loves them? How do you communicate what beauty is to children? If you have a child or work with children, I challenge you to look a child in the eye and tell them, "You are BEAUTIFUL" and God LOVES You! This may open up some dialog so, be ready to share as Holy Spirit uses you to make a difference in the life of a child today! Leave your comments below so we can begin to inspire one another. DISCUSSION: What does the word "beautiful" mean to you?